existence, reprising the number that she had sung many years before. Playing a maid does seem to be the lowest of all theatrical assignments. “Nursemaid” (STREET SCENE) are much better parts. played “Maid of Honor” found it no great honor, either. have a maid’s role as generous as this one. Son” do we see that she’s indeed the wisest of all the characters we’ve met. served, would have loved Petra. Yeston’s prettiest songs, she sings “I want to be a lady’s maid, a lady’s maid in America” where she believes “the streets are paved with gold.” Many immigrants naively thought the same thing and had their dreams dashed once they got here. of any major award in all that time. grandmother in Trenton, New Jersey” — is great fun. someone who could at least be described as a part-time, stay-at-home maid. Remember: Edna Turnblad in HAIRSPRAY takes in laundry. assumed one; at birth she was named, believe it or not, Freedom. weary (although she sings “Heck” instead of “Hell”). 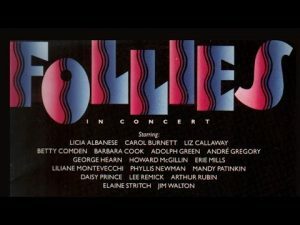 as “the crime of the century.” Many of us would say that title belongs to an event that happened fifty-five years later when the producer of the original cast album of FOLLIES truncated many songs and dropped others. the characters’ minds – even the actress who’d play the maid to be in a show.